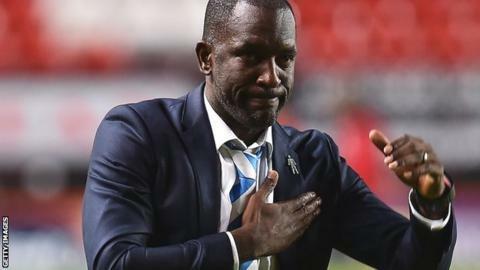 Huddersfield Town boss Chris Powell has said he was not worried about losing his job despite failing to win any of their first six matches of the season. The Terriers achieved their first victory on Tuesday with a 2-1 success at Powell's former club Charlton. "I've always known that we've been close, but it has been a tough period," he told BBC Radio Leeds. "I didn't fear for my future. I've always had belief in this group of players." He continued: "I think sometimes people don't realise how big the changes have been here. "As a manager if you lose your head when all of that is happening then you are going to be in trouble. What you have to do is show the players you believe in them." Tuesday's win saw the Terriers move up from 23rd to 20th in the Championship table. Wales international Emyr Huws, 21, who is on a season-long loan from Wigan, scored what proved to be the winning goal on his full debut for the club before being forced off with an injury at half-time. Powell praised the former Manchester City man's contribution, saying: "He's an elegant player and with losing Jacob Butterfield (to Derby) we needed that player who has a bit of creativity and wants to pass forward," he said. "His delivery from wide and free-kicks was good and obviously he scored from a central area. "We can't rush him and I really hope he's fit for the weekend but the fans will like him. I am looking forward to seeing him flourish."